Welcome to Day 1001 of our Wisdom-Trek, and thank you for joining me. Hello, my friend, I am Guthrie Chamberlain, your captain on our journey to increase Wisdom and Create a Living Legacy. Thank you for joining us today as we explore wisdom on our 2nd millennium of podcasts. This is Day 1001 of our trek, and it is Wisdom Wednesday. Creating a Biblical Worldview is important to have a proper perspective on today’s current events. To establish a Biblical Worldview, you must also have a proper understanding of God’s Word. 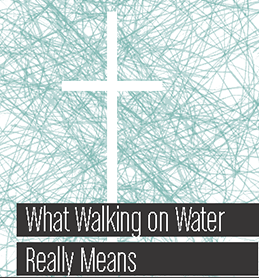 One of the most well-known Bible stories from the New Testament is about Jesus walking on water in the midst of a terrible storm. Most of us miss the underlying significance of this story. Appearing in three of the four Gospels, this event inspires Sunday school lessons and has become ingrained in our portrait of Jesus’ life. As spectacular and unforgettable as the event is to us, however, a Jewish audience would have seen in it a profound theological meaning against the backdrop of the Old Testament. In the Old Testament worldview, the unpredictable sea is a common symbol of cosmic disorder which are conditions contrary to God’s design for an ordered world. This symbol for cosmic anarchy is also personified as a sea monster, known as Leviathan or Rahab. The image of chaos as an untamed monster in a churning, erratic sea was common throughout the ancient world. People accustomed to land would naturally view the vast, raging ocean as uncontrollable and potentially deadly, filled with terrifying unknown creatures. Religions across the ancient Mediterranean often depicted their important deities destroying or subduing the sea dragon, thereby calming the sea and restoring order. In the Old Testament, it is Yahweh, the God of Israel, who conquers the forces of chaos and imposes order in the cosmos (Job 26:12-13; Psalms 89:5-14). This imagery is applied even to the exodus from Egypt (Psalms 74:12-17), where God split the sea to deliver His people, thereby conquering the forces of evil that sought their demise. God’s ultimate victory at the end of the age is also depicted as God dominating the forces of the sea as described in Isaiah 27:1, “In that day the Lord will take his terrible, swift sword and punish Leviathan, the swiftly moving serpent, the coiling, writhing serpent. He will kill the dragon of the sea.” It is also referred to in the book of Revelations 21:1. This is why the description of the final paradise of the new heaven and new earth contains the phrase, “Then I saw a new heaven and a new earth, for the old heaven and the old earth had disappeared. And the sea was also gone.” This is a reference that there will be no more chaos. The Prophet Daniel’s vision of the end of days and the kingdom of God includes four beasts that emerge out of a storm-tossed sea (Daniel 7:1-8). These beasts are not aquatic creatures by nature. They come from the sea because they represent chaos. God’s heavenly court sentences the beasts to death (Daniel 7:9-12), after which the “son of man” arrives immediately to receive the kingdom of God (Daniel [7:13]-14). 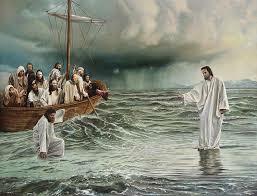 All of this imagery informs John’s account of Jesus walking on the sea during the storm. John identifies Jesus as the Son of Man to whom the Father has given the authority to execute judgment (John [5:27]; compare Matt [26:57]-68). John also asserts repeatedly that Jesus is God incarnate. In John’s Gospel, Jesus invokes the divine name “I AM” seven times in reference to Himself (e.g., John [6:35]; 15:1). He declares oneness with the Father (John [10:30]), and He proclaims that the Father is in Him and He is in the Father (John [10:37]-38). For John, a Jew familiar with the Old Testament, the image of Jesus walking on the sea was a dramatic portrayal that Jesus is Yahweh, the one who subdues the forces of chaos and imposes His will on the waters and everything the waters represent. The kingdom of the Son of Man had begun with Jesus ministry on earth, and all forces opposing God’s ordained order would now be defeated. 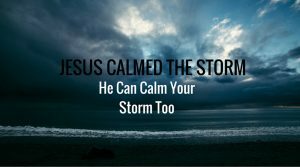 Like Jesus’ disciples, we can find comfort in knowing that the one who treads upon the volatile sea can subdue whatever chaos threatens to overwhelm us. QUICK BIT: The three accounts of Jesus walking on water are found in John [6:16]-21; Matthew [14:22]-33; and Mark [6:45]-52. These three Gospels were authored by Jewish writers. Luke doesn’t include this detail, likely because he was a Gentile writing to a Gentile friend, Theophilus (Luke 1:1-4). As a Gentile, Luke may not have had the same worldview equating the sea with chaos in the world. That will conclude our essay for this week. Next Wisdom Wednesday we will continue in the New Testament as we look at Dr. Heiser’s next essay titled “Born Again…and Again and Again?” I believe you will find this another interesting topic to consider as we build our Biblical worldview. Tomorrow we will continue with our 3-minute humor nugget that will provide you with a bit of cheer, which will help you to lighten up and live a rich and satisfying life. So encourage your friends and family to join us and then come along with us tomorrow for another day of our Wisdom-Trek, Creating a Legacy. If you would like to listen to any of our past 1000 treks or read the Wisdom Journal, they are available at Wisdom-Trek.com. I encourage you to subscribe to Apple Podcast or Google Play so that each day’s trek will be downloaded automatically.